Opening Reception: Sunday, April 19, 3:30–5:00 p.m. The Derfner Judaica Museum and The Art Collection at Hebrew Home at Riverdale host two concurrent exhibitions opening on Sunday, April 19, 2015. 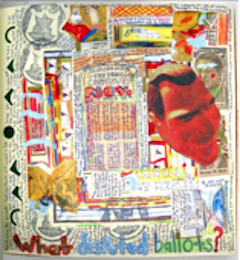 Doug Brin: Journals will be on view in the lobby gallery of the William Goldfine Pavilion and Surrealist Impulse: Works from the Permanent Collection will be on view in the adjacent Elma and Milton A. Gilbert Pavilion. An opening reception and artist’s talk with Doug Brin will be held on Sunday, April 19, from 3:30 – 5:00 p.m. in the Goldfine Pavilion located at 5901 Palisade Avenue in the Riverdale neighborhood of the Bronx. This event is free and open to the public. Please R.S.V.P. to 718.581.1596 or email. 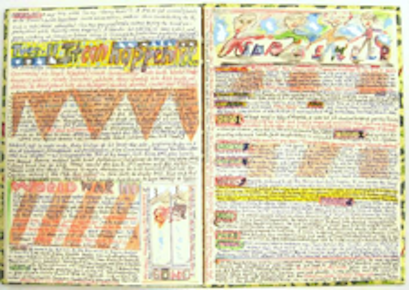 The 17 illustrated journals in the exhibition were created between 1987 and 2013 and represent a selection from a larger body of writings that Brin began when he was 22 years old. 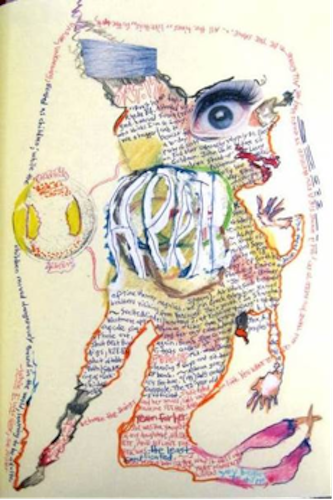 In the journals, Brin, now 67, utilizes micrographic writing, abstracted drawing and collage elements to explore topical, and historical and literary themes. Filled with personal observations plus cut and pasted excerpts from newspapers and magazines, the journals comprise a unique history of our times. Brin’s musings reflect a broad range of past and current events from the worlds of politics, entertainment and literature. An artist, writer, journalist and teacher, Brin provides running commentary on the contested Bush-Gore national election and the aftermath of 9/11. Fred Astaire and Ginger Rogers, Tennessee Williams and Mary McCarthy populate his entries, among many other subjects. 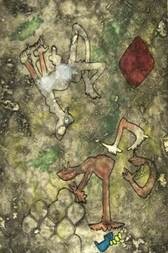 His imagery is varied and excruciatingly detailed, recording wide-ranging personal and popular interests. The journals attest to an obsessive-compulsive nature that has inspired Brin to track and record a life that has included five careers and over 30 jobs, among them journalism, independent-school teaching and current-events seminars, such as ongoing programs at the 92nd Street Y and the RiverWalk apartments at Hebrew Home. While recovering from near-fatal brain surgery in 1997, Brin persevered in his commitment to making regular entries by dictating disjointed impressions of daily existence to his mother and ex-wife. The Surrealist Impulse: Works from the Permanent Collection will include Yosl Bergner (Israeli, b. 1920), Salvador Dali (Spanish, 1904–1989); Joan Fine (American, b. 1949); A. Raymond Katz (American, 1895–1974); Roberto Matta (Chilean, 1911–2002); Joan Mitchell (American, 1925–1993); Pablo Picasso (Spanish, 1881–1973); Nahum Tschachbasov (American, 1899–1984), and Igael Tumarkin (Israeli, b. 1933), among others. This exhibition will explore manifestations of Surrealism in paintings, prints and unique works on paper across a global and temporal spectrum, from Picasso’s series Imaginary Portraits of 1969 to Joan Fine’s Fragments of 2009, sculptural paper works that conjure prehistoric landscapes. With their geometric and organic forms, Tumarkin’s Chaotic Drawings mark the artist’s protest against war, dehumanization, violence and alienation. Bergner was born in Vienna, grew up in Warsaw, and settled with his family in Australia in 1937. He moved to Israel in 1950. 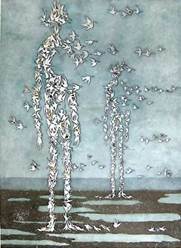 His work Man in Flight evokes his experience of migration. A pivotal Surrealist, Matta is represented with prints from Centre Noeuds. Known for his exploration of the subconscious and his interest in automatism, Matta arrived in Paris from his native Chile in 1933, and was among the Surrealists in exile in New York during World War II, where he directly influenced the future Abstract Expressionists. A second generation Abstract Expressionist, Mitchell’s work is marked by improvisation and spontaneity rooted in Surrealism. As a member of the American Alliance of Museums, Hebrew Home at Riverdale by RiverSpring Health is committed to publicly exhibiting its art collection throughout its 32-acre campus, including the Derfner Judaica Museum and a sculpture garden overlooking the Hudson River and Palisades. The Derfner Judaica Museum and The Art Collection provide educational and cultural programming for all of its visitors, including residents of the Hebrew Home, their families and the general public who come from throughout New York City, its surrounding suburbs and elsewhere. RiverSpring Health is a nonprofit, non-sectarian geriatric organization serving more than 13,000 older adults through its resources and community service programs. Museum hours: Sunday–Thursday, 10:30 a.m. – 4:30 p.m. Art Collection and exhibitions open daily, 10:30 a.m. – 4:30 p.m. Call 718.581.1596 for holiday hours or to schedule group tours, or for further information visit our website here. The Derfner Museum would be able to put you in touch with him.